Have you considered running for office? We all agree we need honest, intelligent, dedicated people in government, so what’s it like to take the challenge? 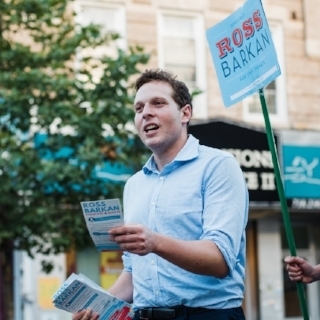 Ross Barkin decided to run for State Senate in New York. He was unprepared for the work, the time, and the dedication it takes to campaign. He ran in the primaries and lost by about 2000 votes. He is forthright in sharing his experience. Once he declared his candidacy, he was officially in the public eye. He learned to worry about everything he said. All of it becomes public record. He discovered that if one person posts a negative impression on social media, it begins to define you, and it freezes an impression in time. We all know there are only two outcomes of an election — you win or you lose. For a time, Barkin believed he would win. He recruited hundreds of volunteers, raised over $100,000, and hired a great team. He opened his campaign headquarters in Bay Ridge and it quickly became a community hub. Barkin noticed he is different in a good way after his year on the campaign trail. “Politics destroyed my sense of shame. I learned to raise funds, to comprehend the deleterious enormity of money in politics. I spent hours on my phone begging for cash, writing emails for cash, eradicating whatever shame I have left and just doing it. I can ask, I can beg, I can stand on a street corner and pitch myself — this body, this face — for four hours at a time. Campaigning educated me. I learned neighborhoods on an intimate level, block-by-block, door by door. I talked to literally thousands of people. I came to understand the disparity of incomes, and the diversity of life in far more consequential terms than I ever would any other way. I applaud Ross Barkin for sharing his experience. I didn’t delve into his politics to know if I would vote for him, but I admire him for running for office. Imagine giving one year of your life — 15 hours of every day — to campaigning. Think of the time it takes to refine your goals and arrive at solutions to problems of transportation, education, health, safety, taxation, infrastructure, housing, campaign finance reform, cyber security, and jobs. I know I’ve missed some important issues including the biggest one — balancing a budget for it all. Imagine channeling your hopes and ambitions into a single endeavor that can have a positive impact. Tempted to run for office? We need you.